Euphorbia grandicornis likes full sun and can take lots of water in the warmer months, and should be neglected in the colder months. 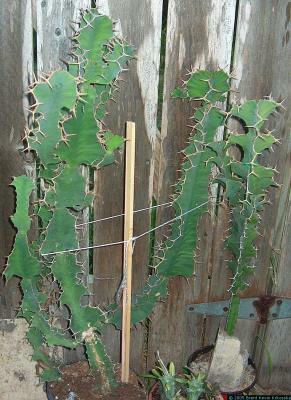 Like all Euphorbias, cuttings are easy to root when its warm, the caustic saps flows like wine, it doesn't like to freeze, and the spines are hard and will cut you good. I've found this plant is especially good-looking when planted in the ground in full sun in combination with Asparagus springerii. The Asparagus insulates and shades the bottom, and the Euphorbia supports the Asparagus, and the overall effect is very cool.